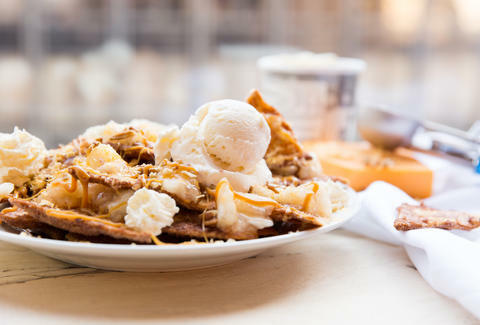 Like a beautiful love child of Lady Liberty and the Alamo, everything I love about apple pie -- flaky, buttery crust; warm, spiced apples; melted cheddar and vanilla ice cream -- is layered in each bite of these “nachos.” Plus, it’s a finger food. But the best part? It fixes apple pie’s one flaw: it’s ready immediately when I’m craving it and is easy as, uh... pie. Combine sugar, apple pie spice, and salt in a large resealable plastic bag. Cut each tortilla into 8 even wedges. Brush both sides with butter. Toss into the bag, seal it, and shake to evenly coat the wedges. Arrange wedges in a single layer on sheets and bake for 10 minutes. Flip the wedges and bake for another 10 minutes. Remove from oven and let cool slightly. In a medium bowl, heat the apple pie filling in the microwave for 2 minutes on high. 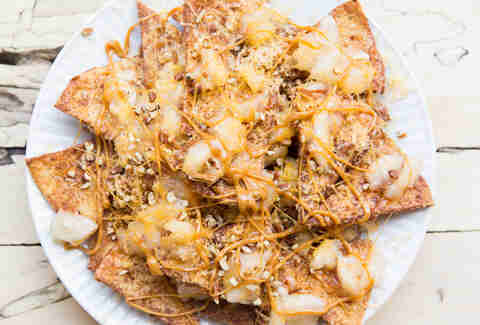 To assemble the nachos, arrange chips on a large platter, spoon apple pie filling evenly over the chips, sprinkle with cheddar and pecans, drizzle caramel, dollop ice cream and whipped cream on top.